Music speaks to people—touches people—in ways words alone cannot. How Can Music Act as Medicine? Vijay Gupta is a violinist and educator whose efforts to merge music with mental health are changing the world, note by note. 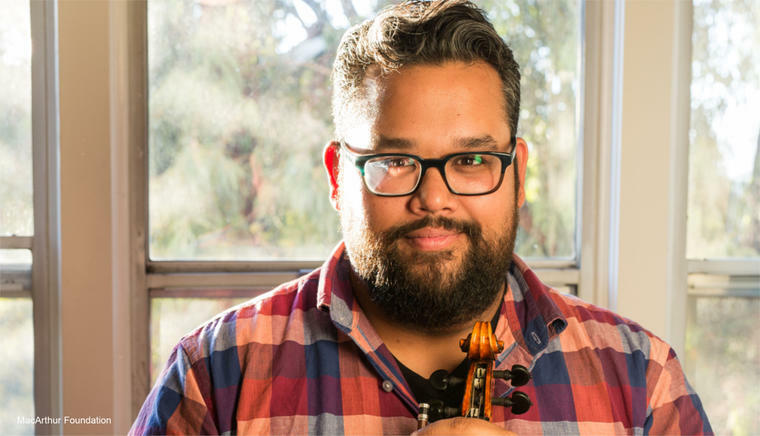 Named a 2018 MacArthur Fellow for “providing musical enrichment and valuable human connection to the homeless, incarcerated, and other under-resourced communities in Los Angeles,” Gupta is the founder of Street Symphony—a musical advocacy program that empowers citizen-musicians by engaging with communities experiencing extreme poverty, incarceration, and homelessness. The results have been extraordinary. Gupta made his solo debut with the Israel Philharmonic Orchestra under the baton of Zubin Mehta at age 11, and has performed as a recitalist, soloist and chamber musician on an international scale since the age of 8. He has also performed as a guest concertmaster with the Los Angeles Opera and the UK’s acclaimed Philharmonia Orchestra. Gupta serves on the faculty of the Longy School of Music of Bard College Masters of Arts in Teaching (MAT) program, which prepares musicians to become agents of change through the study of performance, music pedagogy and social justice. Gupta also serves on the board of directors of the DC-based national arts advocacy organization Americans for the Arts as well as Los Angeles’s beloved 24th Street Theatre, which serves to engage, educate and provoke a diverse community with excellent theatre and arts education. In 2015, Gupta was presented with an honorary Doctor of Humane Letters by the University of La Verne and at age 29, was awarded the Leonard Bernstein Lifetime Achievement Award for the Elevation of Music in Society from the Longy School of Music of Bard College. Vijay Gupta encounters a lot of students, many of whom are expected to capital-A achieve. The South Asian student body in particular, from as young as 15 and up to 25. Whether it’s pressure from parents or expectations within their communities, they don’t feel free to pursue creative or expressive lives and are instead expected to be doctors, lawyers, and engineers. The culture in India or in South Asia revolves around family, religion, food, music. Bereft of that context in the North America, young people grapple with burnout, doubt, and even mental illness. In this sensitive and pragmatic talk, Gupta speaks to the ways in which educators, parents, and students themselves can enable youth to explore the multiple facets of their identities in full, as he himself did through violin, and the community engagement of Street Symphony . In this talk, Vijay (Robert) Gupta explores the connection between music and mental health, explaining why music’s redemptive power may hold more potential than we realize. Gupta draws from his work as director of Street Symphony—a classical music outreach concert series—to illustrate how music can help bring people back from the brink of their darkest times. How does music speak to people in ways language cannot? Why is music education vitally important, especially to those who are most in need? Erudite, eloquent, and passionate, Gupta shows audiences that music isn’t just something to be enjoyed—it's something that can change lives. Vijay Gupta believes strongly that music should be a fundamental element in an educational curriculum, beyond an extracurricular hobby or even a medium to facilitate instruction in other fields, such as math or science. In this talk, he shares his personal journey in music education, tying in his experiences as a young musician struggling to find the meaning in music with the lack of programs and support, as well as the stigma he faced at choosing between a career as a “responsible person” in science and a career in his life’s passion, music. That stigma still exists around music and the arts. Gupta believes music educators are true pioneers in the kind of human education that will shape the kind of empathic and compassionate socially connected lives that our world demands of our young people. Music gives us these human tools, says Gupta—the relational discipline grounded in passion that truly can affect change in the world around us. Get to Know Lavin’s MacArthur “Geniuses”!